Before anything, PowerSquare, the maker of ENGO, is currently giving a huge 60% discount for their $229 ENGO music, charging, and docking station available ONLY for the first 24 hours. That brings the price all the way down to $99, that’s $130 off the original price. You can also get as much as you want, so hurry up and avail their one-time deal on Kickstarter! ENGO has a lot of things going on, it’s a Bluetooth speaker, powerbank, fast wired charger, and a Qi wireless charger. Let’s start with the speaker side of this all-around device. The ENGO has a Bluetooth speaker which can be used by any Bluetooth device. The speaker has a 150Hz to 20KHz range, which is great for most music needs. This is done by using a 40mm high-excursion subwoofer with a custom made 45mm high-sensitivity driver. ENGO also offers clean sound without any distortion even if you put it on full blast. There is also a mic available for Facetime, Skype, or any other application that may use a microphone. Interestingly, you can use two ENGOs to use it as stereo speakers. Each ENGO has a stereo chip inside giving them the ability to be used as either left or right speakers. It also offers NFC for effortless pairing. The battery built inside the house-like device is a huge 10,000mAh Li-poly battery. This is large enough to charge the iPhone 6s 4 times, and still have some power left. 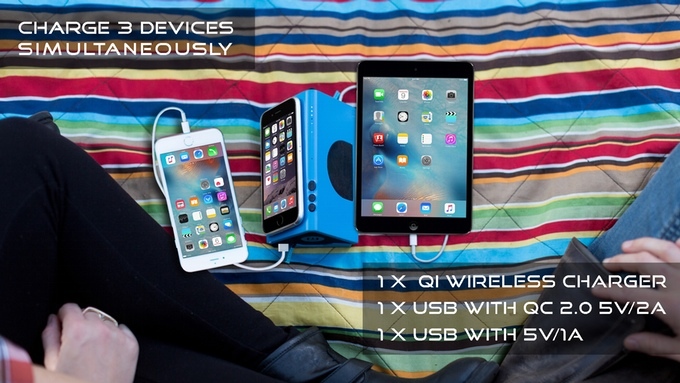 With that huge battery, PowerSquare also made it able to charge 3 devices all at the same time. PweroSquare’s new device can charge one device with its Qi wireless charging pod, and two more through USB ports which are compatible with Qualcomm’s Quick Charge 2.0 and Samsung’s Adaptive Fast Charging. The Qi wireless charging pad on the ENGO is slightly angled to have your device facing approximately 45 degrees up. This gives an optimal viewing angle and with the micro-suction surface, will make sure that your device won’t be slipping off. The ENGO also has an IPX4 rating offering a water-resistant body. This is not made to be dipped into a pool, but you can feel relieved if ever it may get splashed from time to time. All in all, the ENGO can replace your Bluetooth speakers, docking station and multiple powerbanks for a very reasonable price. Get yours now by backing them up on Kickstarter! Their 24-hour promo will last up to June 15, 10am EST making the ENGO available for just $99 for either the ENGO with wireless charging or without. 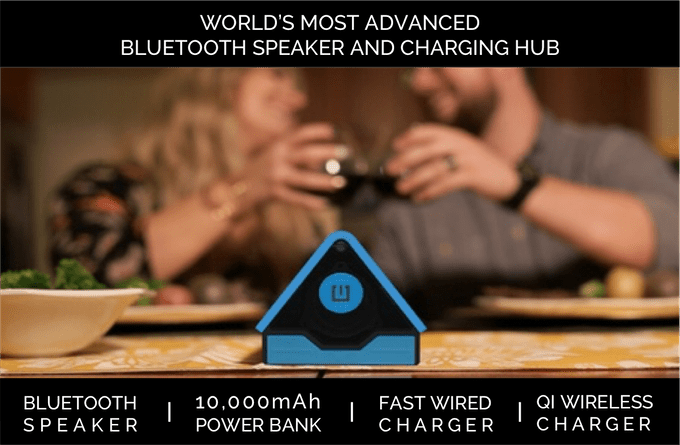 If ever you weren’t able to reach the promo, they do offer a $129 option, you may add $20 if you would also want the Qi wireless charging feature.